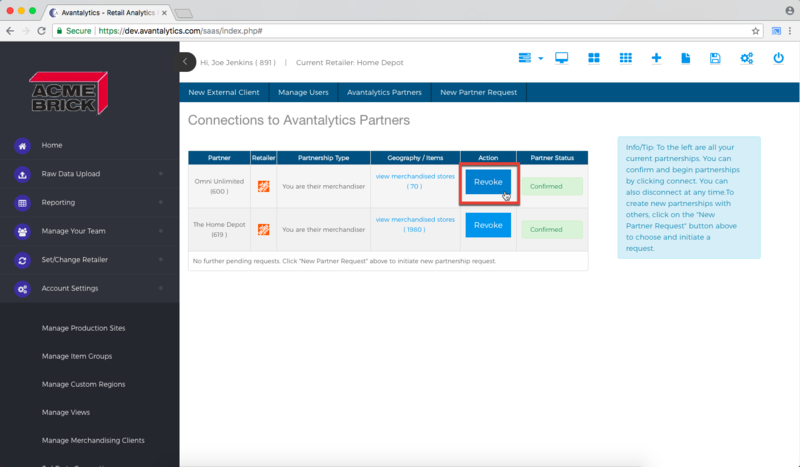 3rd party connections allow you to share certain data with other Avantalytics customers. Most often the sharing is for the purpose of merchandising coordination, the sharing of tasks, and perhaps shipments. 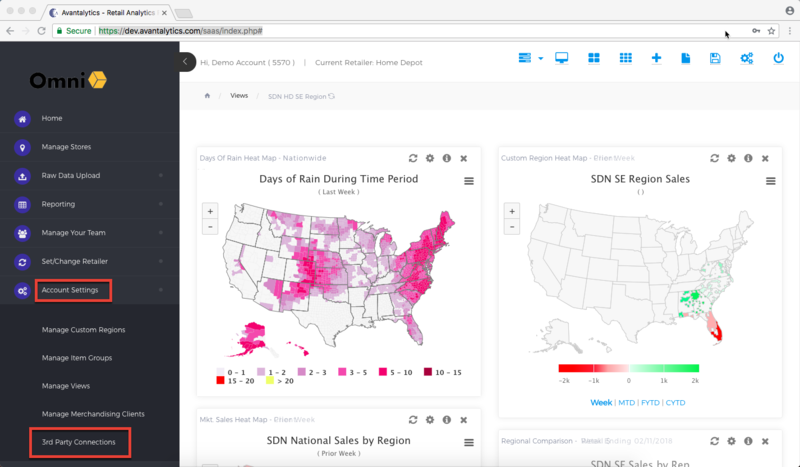 This allows you and other customers to coordinate and share limited data in real-time with each other. 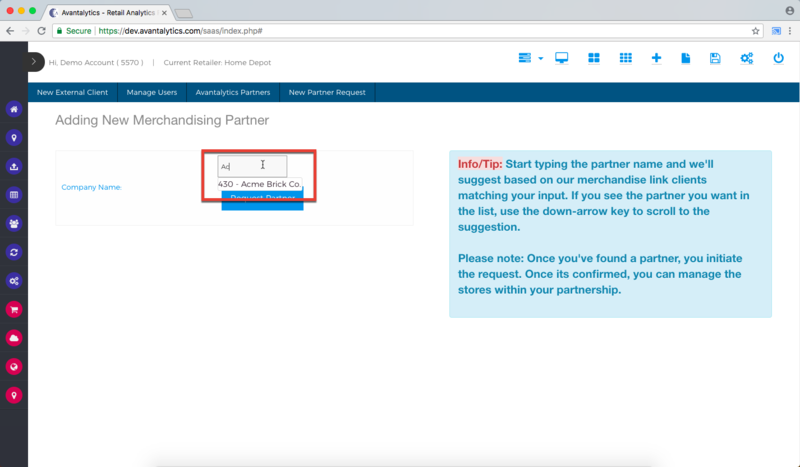 Your partners can complete tasks you create, you can view photos uploaded by them during store visits on your behalf and so on. 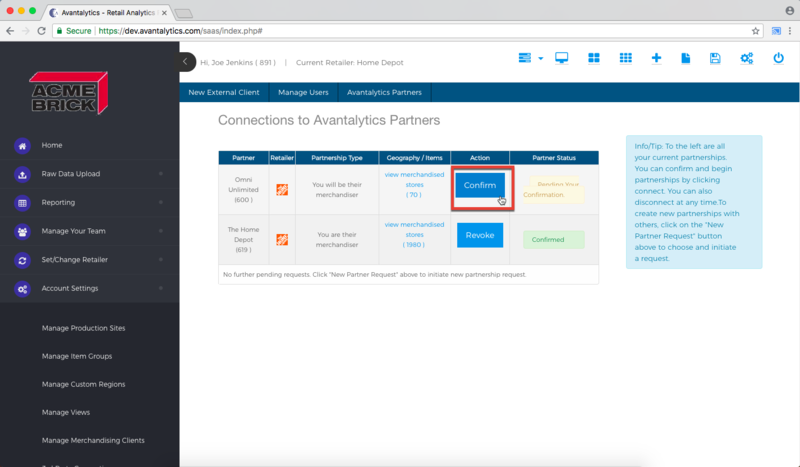 If you are looking to establish a 3rd party connection with an Avantalytics partner, in order to coordinate merchandising, simply follow the steps below. From the left menu, go to Account Settings > 3rd Party Connections. 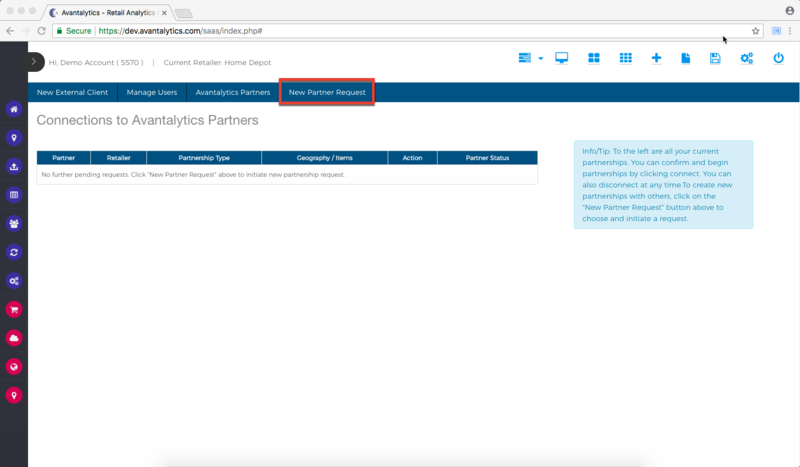 Click on "New Partner Request." 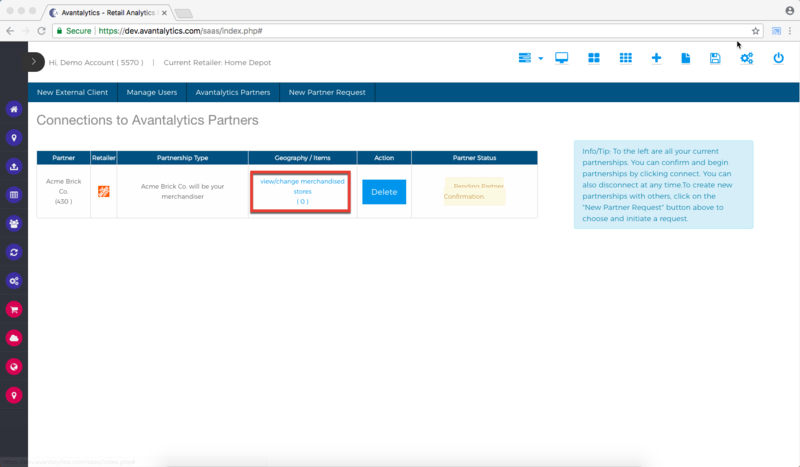 A dialog box will appear where you can enter the name of the partner you are requesting. 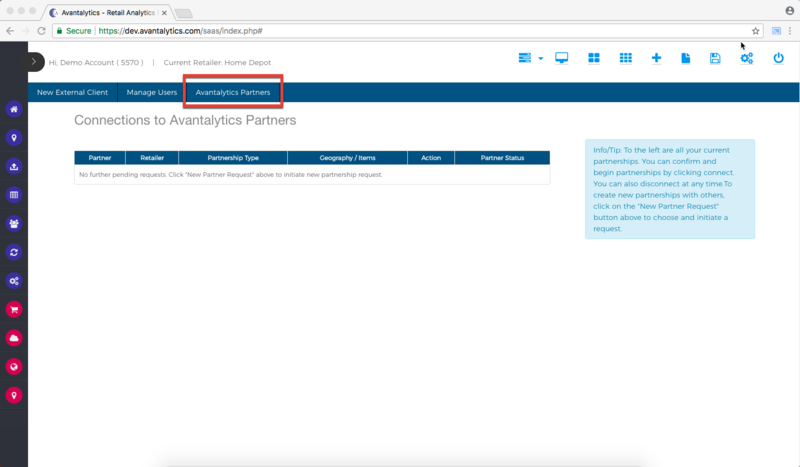 Since everyone you could be requesting for this type of connection is also an Avantalytics user, the name should autopopulate. Once it comes up, select it from the pop-up, drop-down menu and click "Request Partner." Once you've requested the connection, they will appear in the menu as a "Pending Request" until the partner accepts your request (which we will show you momentarily). While the request is pending, you can add the stores that the requested partner will have access to for merchandising purposes. This directly relates to your ability to assign tasks to different merchandisers in different regions. To do this, click on the "view/change merchandised stores" hyperlink. 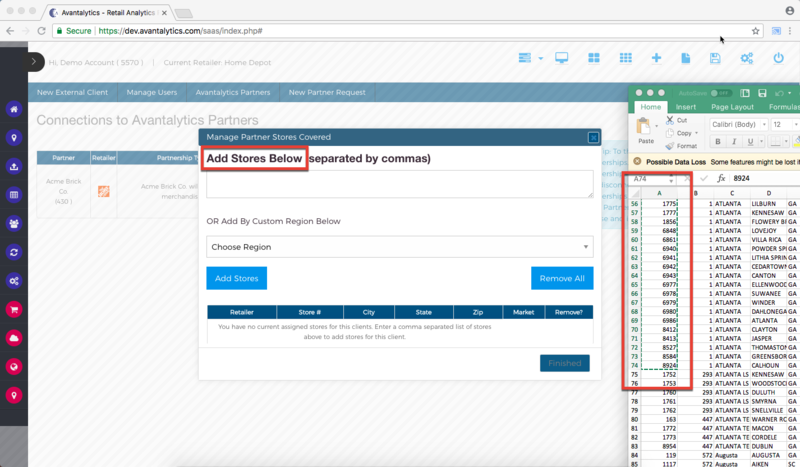 This brings up a dialog box that allows you to either use the drop down menu to select a custom region (to learn how to set up custom regions, please click here) or you can insert a store list from an Excel or CSV document. 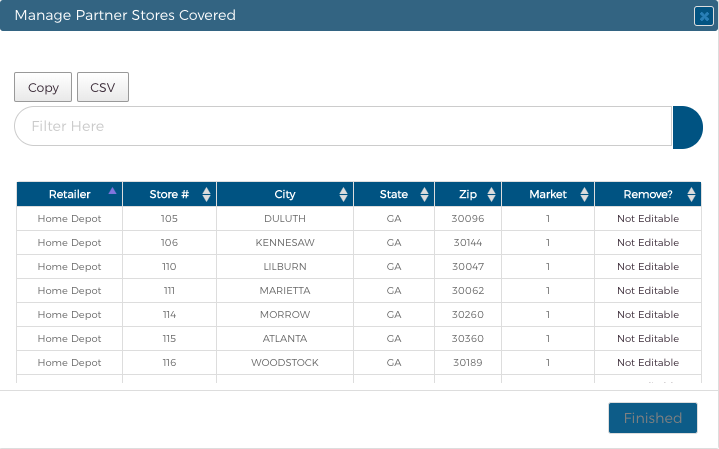 Simply copy and paste a list of store numbers and you are good to go! Once uploaded, you can always click on that same hyperlink to review and alter your store lists. You can either click the "Remove All" button to remove all the stores, or remove them individually by clicking on the red "X"s. You can use a search bar to filter results or copy or export the list as a CSV document. When the partner logs in to review your request, it will look like this. They would simply need to click confirm to establish the connection. All either party needs to do at this point to sever the request in the future is to simply click "Revoke." 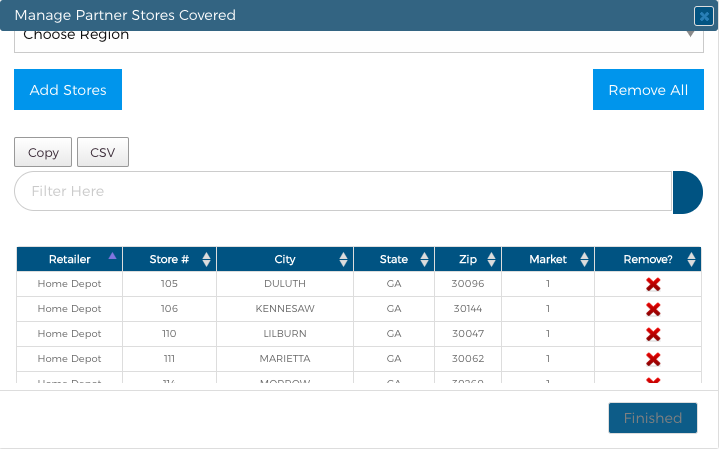 The merchandiser has the same visual access to the store list as the requesting partner, however you will notice that they cannot alter the store list in any way. They can simply filter, copy or export as a CSV. And that's it for establishing 3rd party connections!